People have always been shallow in their assessment of one's character. They expect renown deeds and great talents. They search for uproar, the kind that deafens, and glitter, the kind that blinds. They bow down to famous scholars, artists, philosophers, sportsmen, poets, inventors, and heroes. They pay little attention to the modest laborers and ascetics with unknown doings, who in the deep silence of their monastic cells proceed along their chosen path, giving it their full inner strength, their whole life and not wanting to know any other rewards, except for the realization that their work is fulfilled in front of God and man. In other words, in life's most complex structure, the latter are just as essential as the former. It can be said, that the world is dependent upon them since they determine its path and direction. They can be compared to the tiny and unnoticeable gears, that often guide the movements of a big and complex eight-color printing press, without which, a clear image would not be possible and the resulting color depiction would be indecipherable, cheap, and unappealing. May your memory not be diminished, my dear brother, Father Ignaty, if I rank you to the people in the second category. In all the days of your life, there was nothing unusual. In your time there was no chance to make new discoveries. You did not leave behind volumes of work. Your modest seminary lectures were not filled with listeners, afraid to miss your every word. Nonetheless, when you were no longer around, everyone felt an unredeemable loss, an unfilled gap and void. What can we conclude from your accomplishments and their significance, dear brother? It is the hidden inner worthiness, the unseen virtues, that truly adorn a monk-priest, which together, completely personified you as an individual. These virtues being; blameless integrity, blameless self-discipline and blameless modesty. Yes, integrity, discipline, and modesty is what forced many to bow in front of you throughout your life, and is what joined us all in our common feeling of inconsolable sorrow after your death. Adapting to groups as a so-called follower, was foreign to your character. You were always independent and consistent. Everyone knew this and cherished it. The high standards you imposed on yourself, forced you to always act strictly towards your immediate responsibilities as a priest, teacher and editor of "Orthodox Russia". The church was always heaven to you. When you stood in the choir, fulfilling your obedience as regulator (ustavsheek), reader, singer and choir director, the services to the Almighty went by gracefully. Your prayerful frame of mind and your voice, brought those standing in prayer closer to the Throne of God. May your memory not be diminished, dear brother, if I can place you partially into the first category, the category of scholars. If of anyone, it can be said of you, without any hypocrisy, that fulfilling God's word "search the scriptures" (John 5:39), and applying them, "hold fast to what is good" (2Thess. 5:21), were your primary tasks in life. You were not a small child, rocking every which way "blown about by every wind of doctrine" (Ephesians 4:14). No, you were a "man of wisdom", who even with the full knowledge of the present times' rebellious tendency to fall off the path of righteousness, was able to preserve the wholeness of your Christian view of the world, so priceless and rare in our current times of troubling views and the ever increasing uncertainty of belief. Your success in everything was no less remarkable as were your stern and sound convictions. Never did you allow any modification of your rooted fundamentals, nor did you make yourself accessible to compromises and fluctuations. Like a granite cliff, you stood the highest amongst your cluster of monks. This absolute genuineness and non-hypocritical pure heartedness surrounded your distinguished character and intentions. Your intentions were pure. Your intentions were concrete, persuasive and steadfast. It is not surprising that these qualities, amongst this small cluster, brought forth respect and absolute trust, which are far greater than any kind of popularity of which you did not seek. 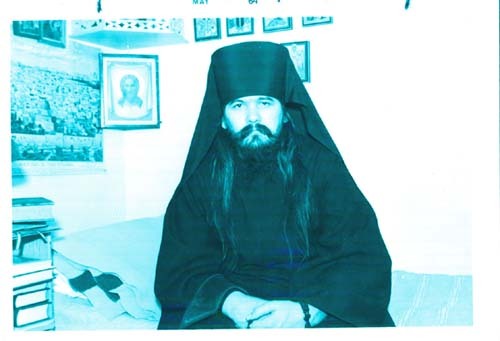 Your 30-year monastic deeds prove this: you passed on to the Lord in the modest rank of Hieromonk. In your calling, you did not seek human praise but rather you sought to please God, and there was nothing else more important in your life than fulfilling this obligation. Feeling morally responsible did not give your poor heart peace. Without complaint and by pushing the limits of your remaining physical strength, you endured your sickness and continued to fulfill your obligations with eager and ardent interest. Before dying you willed for us this model of the most pure and non-hypocritical dedication to duty and obligation. With patience and sorrow, as you would leave to start your duties in the early morning hours, you tirelessly labored dear brother. This daily labor garnished by sultry afflictions and disenchantment, had broken and wore away your valiant strength and exhausted you to the point that you became gravely ill. Oh how regretful, forever regretful, that your days came to an end so soon, and that evening had set so soon in your life. The only notion left to comfort us was that the evening was quiet, clear, peaceful and the fact that the onset of death could not invade the peace in your soul. With a smile you said good-bye, to my matushka-wife: "thank-you, nothing else is needed, tomorrow, tomorrow . ". Knowing that your deeds were completed honestly, the suffering heart of a true monastic was filled with much happiness as you lay on your deathbed. With a serene conscience and with hope for everlasting peace, you passed on into the grave. Your life expired 10 years ago on March 1, 1991, but a new life kindled, in a world unseen to us, a place filled with new sounds, incomparable to the "lonely songs of the earth", unexplainable and beyond our full understanding. Let your bright memory always remain dear in our hearts and provide us support for our noble and moral quests, to keep alive love of work and to always be ready, as was characteristic of you, to honestly and nobly serve the cause which everyone of us is called to in life. To your eternal memory dear brother, Father Ignaty.